Written by CMOS Bulletin SCMO on August 15, 2018 . Posted in Espace, Quoi de neuf. La lune a été et demeure toujours un centre de grand intérêt dans le champ des sciences planétaires. En raison de son atmosphère extrêmement mince (typiquement, vous ne trouverez pas plus d’un million de molécules par centimètre cube tandis que sur Terre, la densité au niveau de la mer est typiquement supérieure par douze ordres de grandeur), la lune a longuement été considérée comme ayant aucune atmosphère que ce soit. Toutefois, grâce aux missions Apollo ainsi qu’aux missions subséquentes du Lunar Reconnaissance Orbiter (LRO – l’Orbiteur reconnaissance lunaire) et du Lunar Atmosphere and Dust Environment Explorer (LADEE – l’Explorateur de l’atmosphère lunaire de son environnement de poussière), nous possédons maintenant une meilleure compréhension de la composition de l’atmosphère lunaire. Des traces d’atomes de sodium, d’argon, et de potassium dans l’atmosphère ont été décelées au moyen de télescopes terrestres tandis que d’autres gaz tels l’oxygène, le dioxyde de carbone, et l’azote ont été détectés grâce à des mesures effectuées lors des missions Apollo. Les volatils sautent sur la surface suivant des trajectoires balistiques pour se reposer éventuellement dans des zones en permanence à l’ombre. De déterminer la distribution et la taille de ces gisements peut nous en dire long sur les cycles atmosphériques de la lune. Il y a aussi une atmosphère poussiéreuse étendue résultant du bombardement constant de micrométéorites. La LRO et son complément la Lunar CRater Observation and Sensing Satellite (LCROSS – Le satellite d’observation et de télédétection de cratères lunaires) ont par la suite découvert des réservoirs d’eau situés au pôles, évoquant la possibilité d’un cycle de l’eau sur la surface lunaire [Dunbar, 2013]. Plusieurs missions lunaires sont prévues afin d’étudier la distribution de réservoirs d’eau sur la lune en profitant des changements de la réflectivité de la glace et du régolite à différentes longueurs d’ondes. Des travaux de simulation réalisés dans nos laboratoires montrent que cette détection peut être accomplie de façon passive grâce à l’instrument FUV et le rayonnement visible. Puisque la Terre et la lune partagent une origine commune en ce qui concerne l’eau, une analyse d’échantillons d’eau provenant de ces réservoirs pourrait aussi offrir des aperçus sur l’historique de nos propres océans. The moon has been and still is an area of great interest in the field of planetary sciences. Because its atmosphere is extremely thin (typically, you will find no more than one million molecules per cubic centimeter, whereas on Earth the density at sea level is typically twelve orders of magnitude greater), the moon was once widely regarded as having no atmosphere at all. However, thanks to the Apollo missions and the subsequent Lunar Reconnaissance Orbiter (LRO) and Lunar Atmosphere and Dust Environment Explorer (LADEE) missions, we have a much greater understanding of the composition of the lunar atmosphere. Earth-based telescopes have detected traces of sodium, argon and potassium atoms in the atmosphere while measurements from the Apollo missions detected other gases such as oxygen, carbon dioxide and nitrogen. There is also an extensive dust atmosphere resulting from the constant bombardment of micrometeorites. The LRO along with its companion the Lunar CRater Observation and Sensing Satellite (LCROSS) later discovered water deposits at the poles hinting at a possible water cycle on the surface of the moon [Dunbar, 2013]. With such a low density, the lunar atmosphere is technically a “surface boundary exosphere”. Indeed, the conditions near the surface of the moon are very comparable to the outermost layer of the Earth’s atmosphere. The difference between the bulk of the terrestrial atmosphere below the exobase (the boundary between the thermosphere and the exosphere) and the exosphere above lies in the way molecules interact with one another through collisions. Below the exobase, atmospheric molecules are constantly colliding, evening out temperature and compositional properties. However, in the much thinner exosphere, molecules are extremely unlikely to collide, and their trajectories are constrained only by incoming solar energy and gravity giving rise to ballistic motion. Molecules that have gained a lot of energy from the sun may even find themselves escaping the gravity of earth completely (Jeans escape) and fly off into space never to be seen again [UCAR, 2011]. Ultimately, the exosphere is the boundary between the atmosphere and space. Understanding the exosphere is therefore very important for understanding the dynamics of volatiles on the moon, in particular: water. 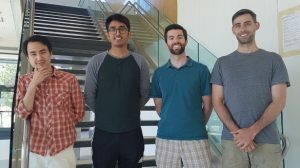 Our group, the Planetary Volatiles Laboratory at York University, is very interested in how water molecules migrate ballistically across the surface and how that movement can be detected. Additionally, understanding the dynamics of the lunar surface-bound exosphere allows for greater insight into the processes that affect other planetary bodies with a similar atmosphere including Mercury, large asteroids, and the moons of the giant gas planets. Another open question is from which source did the Moon’s water originate? Possible sources include delivery directly by impacts or recombined hydrogen implanted from the solar wind [e.g. Sunshine et al., 2009; Dyar et al., 2010; McCord et al., 2011]. All of these sources also impact the water inventory on the Earth and, as such, reservoirs of ice on the moon may preserve a record of bulk water delivered to the Earth-Moon system by cometary impactors. Perhaps as much as 1014 kg could have accumulated over the past 2 Ga [Arnold, 1979]. Another exciting possible source is that the moon could have retained some water sourced from the Earth following the giant impact which formed the satellite. Analysis of the isotopic composition of hydrogen from ancient lunar highlands samples and water reservoirs on Earth show remarkable consistency, strongly suggesting a shared origin between lunar and Earth water [Barnes et al., 2014]. For exploration, this water ice offers a potential readily available source of hydrogen and oxygen that can be used to sustain exploration activities. The water itself can be used by astronauts directly as potable water, the oxygen can be used to manufacture breathable air and the hydrogen can be used as a feedstock to produce fuel for operations and eventual return to the Earth. Knowledge of ice deposit locations and reservoir inventories would be an important factor when deciding where to build a potential lunar base. In short, the water deposits on the moon have high scientific and exploration value. The transport of volatiles is fundamentally different on the moon compared to within collisional planetary atmospheres. Take for example the water cycle; on Earth, water in liquid form can evaporate into the atmosphere where it may ultimately condense and fall back to Earth; may it be in liquid or solid form. Due to the low atmospheric pressure (3×10-15 bar) on the Moon, water is never in liquid form thus must go through different processes to migrate to different regions. 1. A high energy UV photon from the Sun hits the molecule and photodissociation of the water molecule occurs. The energy absorbed needs to be high enough to cleave apart the molecule by exceeding bond energies between its constituents. 2. The water molecule gains enough kinetic energy from the initial sublimation interaction to completely escape the Moon’s gravitational pull and is lost to space. 3. The particle completes its ballistic trajectory and lands back on the surface where it gives up its energy, waiting for the next photon sublimation interaction to hop again. 4. The particle completes its ballistic trajectory at a region of permanent shadow which protects it from further sublimation. On the Moon, using typical solar activity levels, water has a photodissociation rate of 1.26 x 10-5 mol/s, which results in approximately 90-95% of particles photo-dissociating while hopping along the lunar surface before reaching a region of permanent shadow, thus the eventual fate of most water is outcome #1. However, the probability of any individual molecule being photo-dissociated on any single hop is very low. Furthermore, only a small number of molecules (<1%) on the long tail of the Maxwell Boltzmann distribution of sublimation energies gain enough kinetic energy to exceed the Moon’s escape velocity, 2.38 km/s and suffer outcome #2. That leaves the 5-10% that will eventually make it all the way to the permanently shadowed regions near the lunar poles. As a result of the relatively low number of molecules that are dissociated in a single hop or escape on any particular hop, molecules spend most of their time making large jumps near the equator. As they proceed towards the poles, they make smaller jumps, as shown in Figure 1. It is important to note that night time temperatures can plummet to 100 K (Figure 2), meaning particles that land on the night-side of the moon will lay dormant until sunrise. Most of the lunar surface is unstable in terms of temperature, though there are small cold regions near the poles that remain in shadow yearlong allowing for particles to be trapped for long periods of time. These regions are known as permanently shadowed regions (PSRs) and can function as traps for volatiles on the moon. The potential for the PSRs of the Moon to preserve water has been recognized for over 60 years [Urey, 1951]. Spacecraft have observed hydrogen signals consistent with significant deposits of water ice at these PSRs [Mitrofanov et al., 2010; 2012]. Observations made by the Neutron Spectrometers onboard the Lunar Prospector orbiter in the late 1990s [Feldman et al., 1998], later confirmed by the Lunar Exploration Neutron Detector (LEND) experiment onboard the LRO [Mitrofanov et al., 2010; 2012), clearly show the hydrogen signal. Additionally, ultraviolet Lyman-α (121.6 nm) reflectivity [Gladstone et al., 2012] suggest that some of this water may be exposed at the surface. Better understanding of the distribution of lunar water ice is still needed. In some places this ice is observed as frost directly on the surfaces of the PSRs, while in other locations more extensive deposits are inferred below the surface. For the surficial component, distinguishing ice from lunar regolith can be achieved by their different reflectivity at different wavelengths as shown in Figure 3. Since the reflectivity of ice changes significantly going from UV to IR, while regolith reflectivity changes only a little bit, the ratio of images taken at different wavelengths filters can reveal the location of ice. Both NASA and ESA have planned satellite missions to map lunar ice distribution. Both missions will use active remote sensing, using visible and IR light sources carried on board. In our research we have recently been examining a passive remote sensing approach, using far-UV (FUV) and visible light from the background starfield. To investigate the ice in the PSRs remotely, some photons are needed. As luck would have it, PSRs aren’t so shadowed after all – they can see the stars. One of the brightest wavelengths for peering into these dark places is therefore in the Lyman-α portion of the FUV where hydrogen atoms emit light. Quantifying the FUV and visible photon flux within PSRs is important in determining the viability of in-situ passive remote imaging. The precise photon flux reaching the PSR surfaces can be determined using astronomical data sets that map the entire sky in FUV and visible bands. For FUV, the Solar Wind Anisotropies (SWAN) instrument on board the Solar Heliospheric Observatory spacecraft acquires background maps the entire sky in FUV light (115 – 180 nm). To model the visible photon flux within lunar PSRs, we utilize the Color All-Sky Panorama Image of the Milky Way from Mellinger . Additionally, the visible photon flux reaching the PSRs will also be contributed by scattered sunlight from the crater walls, which has been shown to be significant by Mazarico et al., . The results from this work, shown in Figure 4, are presented in the form a map for the north and south pole showing the ratio of FUV/Visible light reaching the PSRs. All areas of color represent a PSR (as determined from the work of Mazarico et al., ). These maps reveal that there are approximately equal amounts of FUV and visible light that reach the PSRs, and little geographic variation is observed at large or small-scales. Figure 5: Experimental set-up for studying UV/Vis reflectivity of ice and regolith. This theoretical work has been complimented with experimental studies that have been performed using a cryo-vacuum chamber within the Planetary Volatiles Laboratory at York University. This chamber will be used to simulate the thermal and radiation environment of the lunar PSRs. To simulate the diffuse light sources that illuminate the lunar PSRs, the ice/regolith samples will be irradiated with FUV and visible radiation sources. 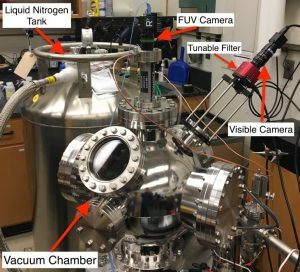 Two cameras were interfaced with vacuum chamber to perform the imaging experiments: a VIS/NIR imager and a FUV imager (see Figure 5), thus allowing wavelength characterization of the samples. Lunar regolith simulant (JSC-1A) and ice samples were held in a small cylindrical copper container located in the center of the chamber. The samples used in our study consisted of: (1) a completely “dry” sample, consisting of pure regolith simulant; (2) an intimate mixture of (roughly) equal parts water ice and regolith; (3) water ice added on top of regolith simulant and (4) pure water ice. These samples were imaged with the FUV and Visible imagers. From these experiments, we can confirm that the reflectivity ratio of regolith changes very little, while as we increase the amount of water ice, the ratio decreases significantly corresponding to less reflection of the ice in the FUV. In summary, the lunar atmosphere is far more than just the vacuum of space. Volatiles hop around the surface following ballistic trajectories, eventually settling in PSRs. Determining the distribution and size of these deposits and can tell us much about the atmospheric cycles on the moon. Several future lunar missions are planned to investigate the distribution of water deposits on the Moon, taking advantage of the changes in reflectivity of ice and regolith at different wavelengths. Simulation work done in our lab shows that this detection can be done passively, using FUV and visible radiation. Since the Earth and moon share a common origin for water, analyzing water samples from these deposits can also yield insights about the history of our own oceans. Moores, J. E. (2016), Lunar water migration in the interval between large impacts: Heterogeneous delivery to Permanently Shadowed Regions, fractionation, and diffusive barriers, J. Geophys. Res. Planets, 121,46–60, doi:10.1002/2015JE004929. Vasavada, A., et al. Lunar equatorial surface temperatures and regolith properties from the Diviner Lunar Radiometer Experiment. Journal of Geophysical Research, 117, 2012. Sunshine, J.M., T.L. Farnham, L.M. Feaga, O. Groussin, F. Merlin, R.E. Milliken and M.F. A’Hearn (2009) Temporal and Spatial Variability of Lunar Hydration As Observed by the Deep Impact Spacecraft. Science 326 (5952) pp. 565-568. Dyar, M.D., C.A. Hibbitts and T.M. Orlando (2011) Mechanisms for incorporation of hydrogen in and on terrestrial planetary surfaces. Icarus 208 (1) p. 425-437.